Luke Seymoup wears many guises: Godfather of Punk'n'B; Badman; Ukulele Enthusiast, Inaugural Intercontinental Folk-Punk Champion; Herald of the Fourth Wave of Ska. He played in a number of Melbourne bands for over a decade before releasing his first solo record "The Professional" in 2017. Taking influence from both his background in Punk Rock and a passion for singer-songwriters such as Bruce Springsteen and Paul Kelly; Luke's songwriting covers everything from fast-paced Punk Rock to slow, heartfelt ballads to rollicking Ska. He followed up his debut release with two EPs in 2018 - "Uke Seymoup", 8 tracks of honest and raw ukulele music, and "Burnett Street" a Ska-Punk concept album over 10 years in the making. Backed by his 3-piece band featuring Brendan Kelly (Keys), Rhys Cogley (Bass) and Martyn Richmond (Drums), Luke has toured right across Australia and supported acts such as The Hard Aches, Slowly Slowly, One Dollar Short, Allison Weiss (USA), Dan P (USA) and The Bennies. 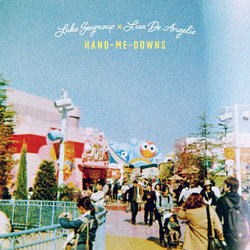 "Hand-Me-Downs" is a collaboration between Melbourne's Luke Seymoup and Sydney's Lisa De Angelis. The pair met in Sydney and bonded over a mutual interest in ghost stories and Gaslight Anthem records. The song, written by Luke, pays tribute to ghost stories of the Hume Highway that runs between Melbourne and Sydney. What does it feel like to be a ghost?